Awnings are a great addition to your structures that not only protect your property from natural elements but also bring in an elegant look that are generally made using canvas, cotton or polyester yarn, vinyl laminated polyester fabric etc that come in different colors, graphic designs and sizes fit for your needs. However,buying and installation needs a lot of guide.Aside from awning's beautifying feature, savings and functionality made this miracle home-improvement product a hit. Utilized for both residential and commercial use, window awnings first time buyers will find the process tricky. Free your mind from worries and let the tips below guide you and lead you to your perfect window awning. Make a survey. This would cover your entire home area. Based with your current window location, identify the direction your windows are facing. Usually, windows that are facing east and west are the ones most hit by the sun's rays. This means that the said awnings on these sides should be longer to cast longer shadows and be more tolerant enough with the sun's glare. Window measurement. This might be the most basic step but the importance of this tip is amplified by the fact that awnings comes in different sizes and homeowners are clueless about this. 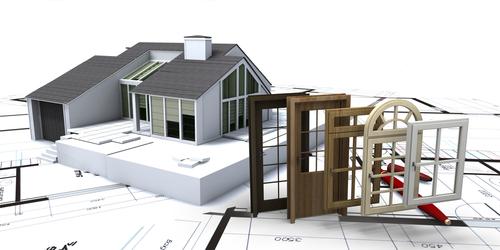 If you have a standard size window then you can have a choice of different styles and design. If not, then you can go custom-made ones which can be quite pricey and possibly with limited choice of design and style. Budget considerations. 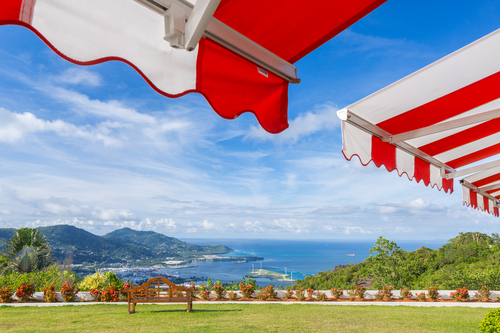 Your allotted budget will have a huge factor with the type of awning you want to purchase. Certain type of awnings can be more expensive as compared to the other one. For example, canvass awning is relatively cheaper compared to wooden awning. It is crucial to choose the appropriate type and style before finally buying. Awning types considerations. This covers the type of awnings to be used. Fabric or canvass window awning is the most preferred homeowner's choice. Its relatively affordable price attracted a lot of homeowners to canvass awnings. Caution though for those who are planning to buy this type as this will require them to do a regular cleaning, maintenance as replacement. Canvass tends to fade faster compared to aluminum types so this means a more frequent cover replacement which is an additional spending on the homeowner's side. Copper awnings probably are the sturdiest and might not be replaced during its lifespan. 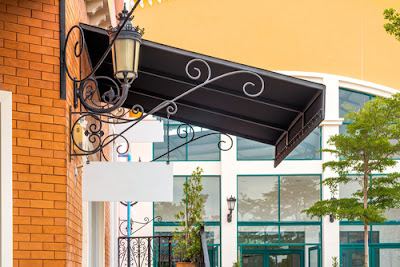 Among awning types, this type costs more as compared to canvass awnings. This type may be expensive but with lesser maintenance and lesser long-term costs. Aluminum on the other hand is more durable as compared to canvass awnings but not as durable as copper window awnings. Your house current architectural design is a huge determinant too to the type of awning to be installed. For example, a specific architectural design may require one awning type will goes well with the current house design. When it comes to the installation of the awnings the first thing you need to look at is the space you want to cover versus the size of the awning and the overhead area that you have available to install it. Many people discount overhead space as a minor consideration, and it is not a deal breaker, but it can have a large impact on how much pitch your awning will have. When people in the awning industry say awning pitch, they mean how many inches does the awning slope down for every 12 inches that it extends from the supporting structure. There are industry standard recommendations, but those vary quite a bit by brand, manufacturer, and size. The main point to keep in mind with awning pitch is that the main purpose is to keep water rolling down and off the material when it rains. 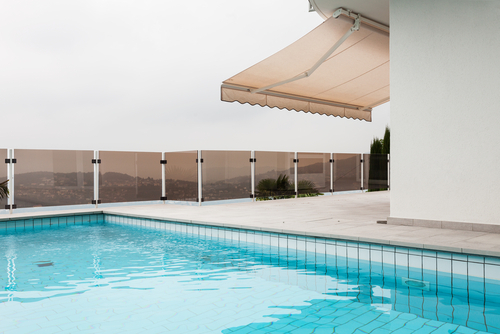 If water pools up it will quickly stress joints, stretch fabrics, and possibly cause the awning to rip or collapse. You want water to flow off the top or side of your awning quickly. The higher the overhead space that you have for installation, the greater the pitch your awning can have when fully extended, and the greater the height between the roll and the ground. This is significant because people will be walking underneath this. Seven feet is considered to be acceptable since the average person is well below that height, but if you have special considerations, you must take those into account. And, the longer the awning (as in, the further out from the structure it extends), the more room you need to maintain an acceptable pitch. The next important aspect is the material of the supporting structure. House exteriors come in all different types of finishes, from vinyl siding to cedar shakes to stucco. All these different finishes require different considerations for installations. Different manufacturers have different mounting styles, but you'll have to install several brackets for supports and the awning fabric retainer, plus some track along the top. These brackets need to be flush with the supporting structure so vinyl siding may need to be cut and shims or blocks put in place to keep the hardware proud of the finish surface. 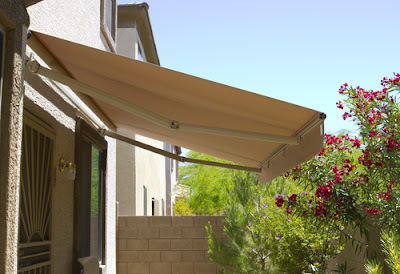 The last thing to keep in mind is that retractable awnings weigh a considerable amount, so you need to make sure that they're attached to studding or some other solid base. They absolutely cannot be attached with any expanding anchors, and I would certainly recommend having a professional perform the installation if you have block or brick exterior. 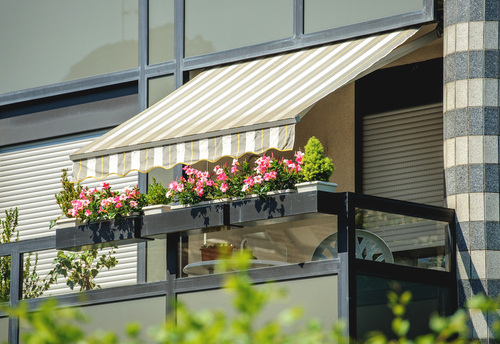 Even if you don't need awnings to cool your home, they are great additions to the exterior of a home, making it easier to enjoy the outdoors with friends and family. These days newer, stronger fabrics are used for awnings, so you don't have to worry about the elements taking their toll on the fabric and causing premature fading. 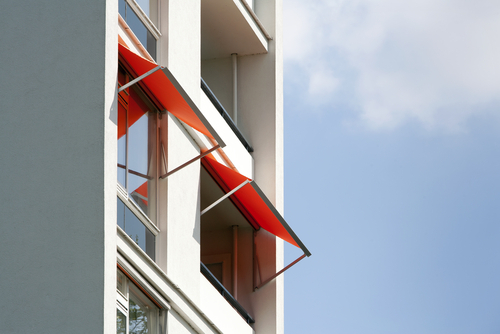 The awnings of today are also designed with style in mind. Beautiful fabrics make a wonderful addition to any backyard or patio, and you can choose colors and patterns that match your outdoor décor and patio furniture. 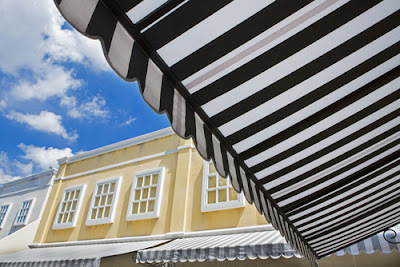 You can find awnings in so many styles and colors - it's amazing! 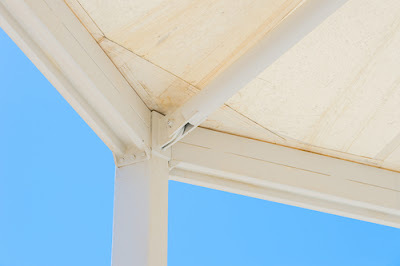 Of course, the most important feature of an awning is its ability to shade you from sun and protect you from rain. When you go shopping for this item, buy a quality brand that won't let you down. Awnings originated from Europe. They are sheets of canvas or any other material which has being stretched on a frame. 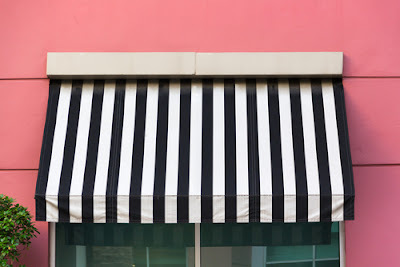 Awnings are used to keep the rain off windows, deck, store front or doorway. 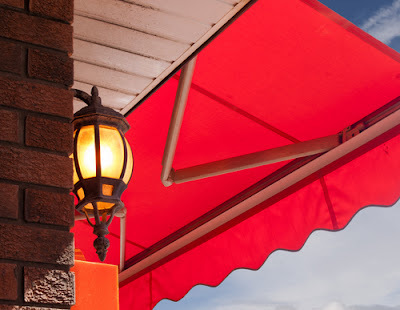 Awnings are therefore used as shelters against adverse weather conditions. Before you make any decisions on the awning you need you have to consider the weather implications. Singapore is an island located in the southeast of Asia. It lacks clear-cut seasons like winter, summer, spring, and autumn. The weather in Singapore is quite humid and warm all round the year with the island enduring a tropical equatorial climate. This implies that there is rain almost every day including the monsoon period. The climate of Singapore is characterized by high humidity abundant rainfall and uniform temperature and pressure. The above climatic conditions are an important point to consider when choosing an ideal type of awning for your Singapore home. There are those who might want to replace existing awnings or repairing old ones, these points will also be of major guidance. Polycarbonate panels are ideal for awnings. They can also be used in sunrooms, solariums, patio rooms and skylights. They come in various types which include foam back, tinted and clear polycarbonate panel. This means they are diverse enough to cater for the diverse needs of homeowners. In spite of the fact that the material used to make polycarbonate panels is quite light, it is also unbelievably tough. It will mostly come with a ten years guarantee. It’s highly resistant to scratches, pressure, and impact, this being the reason why these panels are gaining popularity in making greenhouses and plant nurseries. These roofing are also highly resistant to extreme weather conditions be it high or low temperatures. Therefore, if you need you awnings replaced with something that will be highly durable then this is an ideal material to use. Compared to Galvanized steel, polycarbonate pane is far much easier to install. This translates to a reduced installation cost attributed to by the low labor costs. This translates to an ideal way of replacing awnings at a low cost. It also means that repairing your awning will not be so expensive. For people who want more sunlight in their awning or rooms, they should really consider these polycarbonate panels. Since they are translucent they are able to let in an ample amount of sunlight. For those who want an awning that is bright sunlight then you should consider replacing your awnings with these panels. Polycarbonate panels are quite available when to compare to other materials that can be used on awnings. The price is quite low when compared to the advantages associated with installing these panels. Therefore, for those who cannot afford the high-class awnings consider using these panels since their affordability will also reflect when it comes repairs. 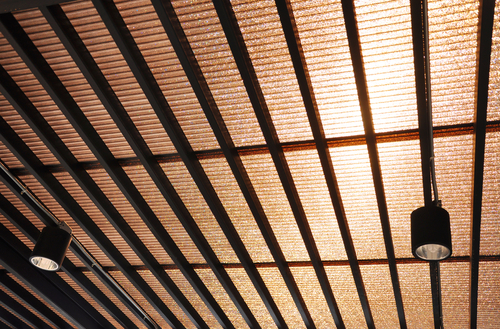 Although polycarbonate panels have a high light permeability, they also effectively block Ultra Violet Rays. This lone quality has made them the ideal material for constructing awnings in most commercial institutions. Replacing your awning roofing with these panels means that you are safe from UV rays. Once you replace your awnings with these panels you need to understand that these panels are highly sensitive to cleaners that contain alkaline and abrasive cleaners. This means that when it comes to cleaning there is the need to be extra careful to avoid affecting them in the process. Also, be careful not to use products with acetone or benzene and other organic solvents to wash the panels. Once you chose the material ideal for your awnings, be it plastic glass or polycarbonate panel, you will then have to decide whether the awning should be retractable or non-retractable. A retractable awning is either motorized on non-motorized. For the awnings that are non-tractable awning are characterized by the way you can retract them to make it look like they are actually not there.For those who need their awnings either replaced with these state of the art awnings, these are some of the categories available. • Full cassette awnings- These awnings are characterized by the fact that the roller, arms, and fabric cover are all fully protected when they are retracted. They stay cleaner for longer when sensibly used. • Semi-cassette awnings- these models have bigger arms and features which make them more powerful compared to the full cassette awnings. Installations are also much easier by openings underneath the cassette. • Open cassette awnings- these awnings are economically friendly. They are an ideal way of shading in locations that are property protected. • Ease of operation- This mostly because they are operated with just a touch of a button. Far much easier than manual retracting. • They are very beautiful- These awnings present a linear and much cleaner appearance as compared to other non-motorized awnings. • Additional features- there are many features that have over time have been incorporated with installing these awnings making them even better; these include the use of sensors to increase automatic control of your awning. While you choose the right material for the awning in your Singapore home, make sure you consider the conditions in your location. This will help you a lot because understanding the conditions will help you choose the right material to use and the ideal model. This will end up reducing the repair and replacing cost to be incurred in future. With the right choice for awning and design, you will not have to keep repairing them. This type of roofing can be used in place of acrylic or glass sheets. It is mostly used for awnings and green houses. It can also be used in patio rooms, solariums, skylights and sun rooms. Polycarbonate roofing is available in various types: tinted, clear and foam back polycarbonate panel. The foam back sheets are mostly used for soundproofing as well as insulation. A polycarbonate panel is easy to install when it is compared to installing galvanized steel. This makes it possible for labor costs to be reduced thereby reducing the cost of installing the panels altogether. As the sheets are also light in weight, they do not weigh down on the building on which they are installed. Their light weight also makes it easier to transport them and also install them. For people who wish to maximize the amount of natural light getting to certain parts of the house they ought to turn their focus on polycarbonate panel roofing material. This is because by virtue of this material being translucent, it is capable of letting an ample amount of sunlight to permeate into the identified area. The polycarbonate roofing has been found to allow light transmittance in structures such as green houses at 85%. It offers a better alternative to glass for a home owner who wishes to have light permeating a certain area of the house better than the other areas. Despite the fact that a polycarbonate panel is made of lightweight material, it is also incredibly tough. Most retailers usually offer in average 10 years as guarantee of this material’s durability. It highly resists impact, pressure and scratches and this is the reason why these panels are fast gaining popularity in the construction of plant nurseries and greenhouses. This roofing material is also very resilient in that it is capable of withstanding extremely hot or cold temperatures. The panel is also resistant to rain, heat and snow. This fact makes them ideal to be used in any kind of environment its harshness notwithstanding. It is able to last longer than the conventional construction materials. This roofing material has also been observed to retain its original appearance throughout its long lifespan without exhibiting any signs of discoloration. Its surface is also famed for being resistant to cracking and dents and this makes it capable of being drilled and used for mounting purposes. One of the great things about the polycarbonate panel is its price. It is priced lowly when compared to other roofing materials like glass thus making it to be more affordable to a large number of people. Its price is very friendly given the large hosts of advantages and benefits it offers people who invest in it. The polycarbonate panels have experienced a quick rise in popularity due to their qualities of being unbreakable and withstanding massive forces. This is the reason why these panels are being used in the construction of windows that are bulletproof as well as police shields. They are also used in the construction of fences, offices and banks due to the added security they come along with thus reducing the costs of armoring these areas. This is another great advantage that a polycarbonate panel offers to its users. Although these panels have a greater degree of light permeability, they are also able to block ultraviolet rays in an effective manner. This quality alone explains why they are the most preferred materials of choice for the construction of awnings and overhead covers in commercial establishments. The same quality also explains why they are the most preferred in the construction of green houses as they are able to keep the harmful UV rays away. When compared to the cost of plastic roofing, the polycarbonate panels appear to be more expensive. This is the reason that most people go for its alternative, the Acrylonitrile Butadiene Styrene or the ABS roofing. The ABS is also relatively tough but it is different from polycarbonate panels in terms of heat and impact resistance which is lower. It is also cheaper as compared to polycarbonate panels and people who do not wish to get the full advantages of polycarbonate panels can settle for ABS. Polycarbonate panels are highly sensitive to abrasive cleaners, solvents and cleaning products that contain alkaline. This calls for extra care and caution to be exercised when cleaning them in order to avoid them getting affected in the process. You should be very careful not to use cleaning substances that contain benzene, acetone or any other type of an organic solvent while washing the panels. The manufacturing process through which a polycarbonate panel is produced is not environmentally friendly due to the very high temperatures involved in the process. Its manufacturing process also requires phosgene, a product that is well known for the harmful effects it has on human beings. The process also requires chlorine which is also known for being environmentally unfriendly. These dangerous products necessitate that polycarbonate panels manufacturing companies to protect their workers especially during the process of manufacturing them. When both the pros and cons of a polycarbonate panel are considered, one will see that the pros outweigh the cons. They are a great choice for roofing materials especially in areas that require more natural light to permeate easily. This consideration is important when trying to find the right materials to use in a construction project. Is Retractable Awning Suitable For Home Use? Bright, intense glare as well as hot the summer sun may make you desire a cool glare. You can achieve this plus a stylish shade solution that will enhance your home through retractable awning. These retractable awnings exist in different qualities and unique features as well as from different manufacturers. • Full cassette awnings: this is an enclosed awning cassette for housing whereby the fabric cover, the roller, as well as the arms is totally protected and stored when fully retracted into the closed cassette. If sensibly used, the fabric of the cover will stay clean for a longer time. • Semi-cassette awnings: this design indicates that there are models with increased arm sizes as well as other features that make them more powerful than the full cassette system. There are openings underneath the cassette, thus installations made much easier. • Open cassette awnings: this cassette is economically as a friendly way of shading for installation location that is property protected. In addition to this, there is the motorized retractable awning and the manually operated awnings that are popular and are chosen depending on the cost as well as desire. However, retractable awnings are made of materials that need to be cleaned regularly because it is exposed to every form of dirt. Awning cleaning can be done individually or contracted from professional cleaning services. With the different types of fabrics they are made from plus the multiple colors, it is clear that professionals will be the ideal people to clean it up because of the skills, training and experience of the cleaning firms. Retractable awnings are suitable for home use is available in multiple colors, fabrics and a variety of sizes. These patio awnings help individuals formulate a nice and cool resting place and gardens that provide the needed kind of natural shade in your compound. 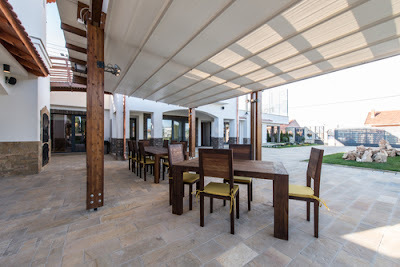 Apart from homes, these retractable awnings are used by hotels and restaurants, cafes, as well as pubs in order to provide dining facilities and seating for customers. • Monza plus fully enclosed and end fix cassette awning: this type of cassette awning is easy to install and is chosen from wide selection acrylic fabric. Monza plus is standard coated in white only RAL 9010. • Monza totally enclosed and end fix cassette awning: this type of awning is suitable for domestic home use and has a projection of 2.5meters by 5metres width. It is easy to install because of the special sliding bracket rather than the traditional end fixed awning. Fabric used in this awning is chosen from a wide selection acrylic fabric listed from Precontraint 302 PVC to Dickson Orchestra as well as Giovanardi collection. • Compact, fully enclosed B50 end fix cassette awnings: this is suitable for homes as well as for commercial use. It has a projection of three meters and a width of five and a half meters. Its acrylic fabrics are taken from a wide selection. It has a special sliding bracket thus easy to install. It is power coated and standard and available in multiple colors like cream, brustor white, brown, anodized silver and anthracite grey. • Compact, fully enclosed B28 cassette awning: this is suitable for both homes, and commercial use and is much easier to install with a projection of 3meters and width of 13meters. This is available in multiple colors and in standard powder coated in anodized silver, cream, ivory, brown, brustor white and anthracite grey. • Elite solid and elegant cassette B28 fully enclosed awning: this is most suitable for large projections like 3metres and above, an arm of 71millimetres deep and four cables that provides extra fabric tension. It has a maximum projection of 3.75meters and a maximum width of 13 meters. It is available in multiple standard powder coated colors of acrylic fabrics. 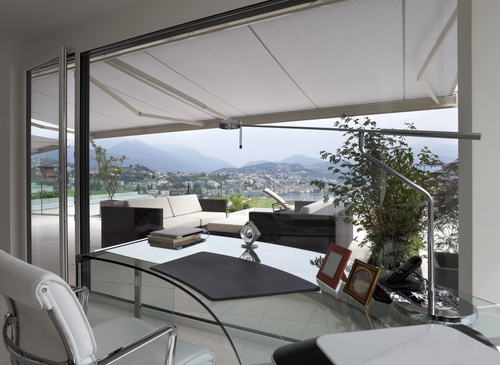 • B29 awning system: this system has a double pitch arm that is unique that overcomes issues that lower mounting heights as well as the outward opening doors, and is also best for balcony installations. The awnings open virtually straight due to the ingenious arm design that drops out halfway in a pitch angle of twenty degrees. It is available in a wide selection of acrylic fabrics and in white hardware. • Awning system B38: this is a valance operated by motor. Has a maximum height of 1600metres that is dependent on the fabric type. It is available in brustor white standard color as well as other RAL colors. • Awning system B2100: this compact is a totally enclosed cassette that drop slides awning arm, which happens to be easy to install because of the special sliding bracket on the cassette rear. This is suitable for commercial use as well as domestic home, and has a width of 5metres and a projection of 1.4meters. It is available in powder coated hardware brown, cream, and white. • Awning system B34XL: this provides the greatest possibility of obtaining a larger projection with limited width. It is available in powder standard coated brustor white and the other RAL colors and with a variety of acrylic fabric selection. • Dutch canopies: this enhances shade at home, made from white aluminium powder coated framework as well as high quality components, which offers maximum durability throughout the year from the weather. • Ultimate terrace awning: this ultimate terrace awning is a sunroom. A structure I put up of aluminium that recreates aesthetic, classical pergola aspect, that is ideal for rain and sun besides it is made of waterproof PVC fabric. It is available in grey and brown colors and the fabric is gas spring tensions. A retractable awning is the best ideal for the provision of natural shade during summer. Mounting the awning to the rooftop by use of special brackets improves the height and light fixture obstruction. The motor is normally encased to the tube of retractable awnings which winds up the material of awning when it is retracted. The up and out awning support is achieved by extending then folds into themselves, then tucks under the tube while the awning closes. A retractable awning is the ultimate outdoor living space for your home that will protect you and your pets from the harmful sunrays. 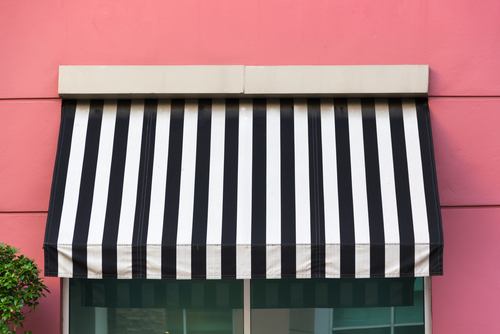 Many people want to extend their homes and businesses, and that is why they use awnings. Awnings tend to be cheap and easily portable. You can use it for personal use at home, or it can also be used in an outdoor restaurant. It offers some elegance and comfort around the area. One of the major differences in the awnings developed is the color. Though they come in different fabric and material, the major visible difference of the awnings is the color. The color of the awnings that you choose will determine the elegance it has and also, it can help to pull more customers into your space. Yellow is one of the most used colors for painting properties, and it has also been popularly used for awnings. 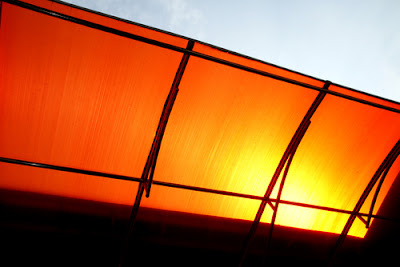 When used in awnings, it is mostly used for another color. For that, you will need to choose a color that matches the yellow perfectly. It could be the light tone yellow or the dark-tone yellow, but choose one that is suitable. Ideally, go for a light-tone yellow if the awning is in a partially hidden. This helps to make the space look brighter. Also, if your property has some yellow paint shades on the exterior, then the yellow awnings are the best to use. Instead of using different colors, you can use a mustard yellow if you have a pale yellow on the exterior wall. Red is supposedly the most romantic or intimate color to use on a property. Choosing a red awning allows you to have various shade options. The good thing about the red awnings is that it compliments exterior paints like tan, yellow, and white. It can compliment any color since it has some neutral aspects that make it a great choice. If you want to use it in a restaurant that hosts couples most of the time, then this is the best awning color to choose. Red creates an intimate environment that is also welcoming. If you are using it in your home, you can blend the red awnings with the blue paint shades of the exterior wall. Suppose the exterior paint has some green pigments, then red is not the best awning color to use. This is because it can seem inappropriate. This is another top awning color that you can consider getting for your property. They blue awnings come in different variations. You can choose deep blue, sky blue, or electric blue awnings. These blue shades tend to enhance the exterior paint of your property with a natural color. The blue awning can go well with a white-painted exterior. You can have some white trim in the blue awnings to make it look even more elegant. If your exterior house painting has some orange touches, you will be careful to choose the right blue shade to use. Green is one of the most earthy colors though it can come in different shades. In Singapore, you will mostly find deep green and moss green awnings. You can blend these two awning colors with an exterior with green and tan shades. If you have natural color on the exterior of your property, then it can also go well with the green awnings. Do not use green if the property has red bricks, or if it is painted red. The two colors do not blend so well. Brown is another popular choice for awnings. It tends to add the dimension to the exterior wall paint. The brown awnings will also come in different shades, so ensure that you choose wisely. Brown can also go well with an exterior with white paint. It creates some comfort and welcoming feeling, so you can choose it for your awnings. Do not use brown if the space is too small, unless you want to add some lighting to it. Brown tends to absorb the light, and it can make a room seem darker, so choose the tones wisely. When you are out of choice, and you find two colors the best of your preferences, then stripes are the best way to go about it. Most of the stripes come in a darker color that goes well with white stripes. 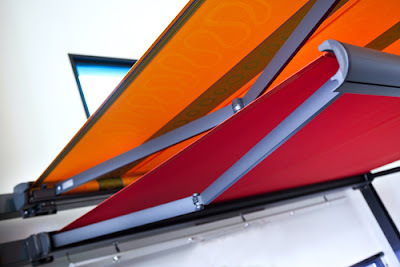 However, you can customize your awning and make them have the colors that you prefer. For instance, you can have red and yellow stripes as your awning color. 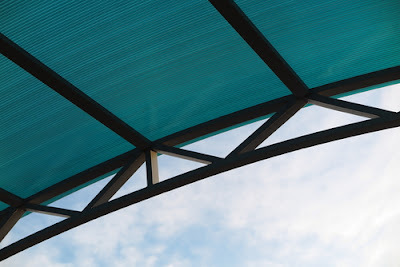 Choosing the awning color is all about satisfying your preferences, and choosing a color that will fit well in your space. The right awning color will make the place look elegant, it helps to create a comfortable and welcoming environment, and you will also enjoy it in your space. Ensure that you consider the exterior paint of your property before you choose the awning color. The two must match well, and the awning should also act as an enhancement of the exterior wall paint. Ideally, find a reputable awning company that will offer you a wide variety of awning colors that you can choose from. The company should also advise you on the best awning color to use, which will complement the exterior paint of your property. Ensure that you choose the color wisely to help you make your space look elegant.